Reprinted with permission from Southland Magazine. Situated ninety miles north of Los Angeles on a narrow coastal plain between the Santa Ynez Mountains and the Pacific Ocean, Santa Barbara is one of only five places in the world where both the Mountains Mid coastline run east and west. Santa Barbara enjoys temperate weather year-round, clean air, miles of' beautiful beaches, fabulous islands, quaint Spanish Colonial architecture and exotic plants from around the world. The earliest inhabitants to enjoy this coastal paradise - the Canalenos (coast dwellers), or Chumash, for their linguistic groupings, lived in this region for over 10,000 years in harmony with the rich abundance of' nature all around them. They subsisted on acorns (of' the indigenous oaks), small game and a rich assortment of' marine life. They wove watertight baskets which they used for all domestic functions made Stolle implements and lived in grass hut villages. The Chumash constructed plank canoes, or tomols. from driftwood coated with natural asphaltum which seeps from rich petroleum fields far below the ocean. It was in these canoes that crews navigated across a sometimes dangerous strait to the Channel Islands, some ten miles offshore These islands still welcome visitors today, but access by powerboat or helicopter is infinitely faster and safer. In 1542, Juan Rodriguez Cabrillo explored the Baja and Alta California coast and claimed it for Spain. A trade route was established between Mexico and the Philippines, and safe harbors were needed for treasure ships, which prompted further expeditions to explore California. Sebastian Vizcaino made such a journey in 1602, during which he mapped the area. On December 4th, the feast day of Saint Barbara, he entered the channel and named the area in honor of the virgin martyr. An overland expedition in 1769, led by Gaspar de Portola (governor of Baja California), was charged with locating suitable northern sites for construction of presidios (forts) and missions-the primary institutions used by Spain to settle its expanding frontier. Between 1769 and 1822, four presidios, three pueblos (towns) and 21 missions were established in what is now California. In 1782, El Presidio Real de Santa Barbara was founded. It was about the size of a city block, constructed of adobe bricks, and took about ten years to complete. The last presidio established in the New World by Spain, it served as a fortress, civic center and hub of social activity in early Santa Barbara. By the 1840s, long out of use, the Presidio fell into ruin, and only a small portion of the original has survived. Today, however, the Presidio is being rebuilt on its original site, based on extensive archaeological investigation, so that visitors may have the chance to experience the austerity of 19th-century life on California's frontier. The Santa Barbara Mission, known as the "Queen of the Missions," was established in 1786, four years after the Presidio. 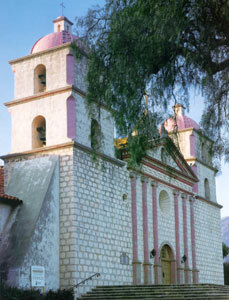 Tenth in the chain of 21 missions, its purpose was to Christianize the Indians, teach them farming and other skills, and make them loyal subjects of the Spanish crown, Expanded and enhanced over a 40-year period, the mission evolved into its classical appearance of today, and is the only California mission with two bell towers. An 1890s photo shows "El Cuartel,"
Spain prohibited foreign trade, but when annual supply ships from Mexico failed to arrive between 1810 and 1812, contraband trade with smugglers became the only source of outside goods. When Mexico gained its independence from Spain in 1822, two major changes impacted California: foreign trade was legalized and Californios were allowed to petition the government for land grants. Millions of acres became private ranches, creating a cattle-based culture and economy. Seafaring Yankees brought cargo loads of manufactured goods to California. Author Richard Henry Dana, a seaman on the brig, Pilgrim, visited Santa Barbara in the 1830s and later described many of the local traditions in his celebrated work, Two Years Before the Mast - traditions that are deeply ingrained in California's "mi casa es su casa" way of life. During the war between Mexico and the United States, Captain John Charles Fremont of the U.S. Army arrived in Santa Barbara on a rainy Christmas Eve in 1846 to claim the area for his country. California became a state in 1850, and a new and dynamic era was underway. Fueled by "gold fever," cattle prices rose from $2 per head to $35 when driven north to feed those in the gold fields. This continued until the 1860s, when a drought killed off most of the cattle in Southern California. Lotusland, home and exotic gardens of European opera diva Mme. Ganna Walska, is depicted in a 1920s tinted photograph. Stagecoach service to the north began over the San Marcos Pass in the 1860s on a precarious road (made even more dangerous by highwaymen) carved out by Chinese laborers. Southbound stage drivers had to be familiar with the local tides, since the 30-hour-plus trip to Los Angeles required navigating around Rincon Point at low tide. Earlier, steamboats carrying goldseekers from Panama to San Francisco would stop frequently at Santa Barbara. Since there was no wharf, lumber and cargo sometimes were thrown overboard to float ashore, and passengers had to be carried on the shoulders of sailors or rowed to shore. With the backing of local rancher Col. William Hollister, Stearn's Wharf was completed in 1872, making arrival in Santa Barbara considerably easier. Soon after, a rush of Eastern healthseekers discovered the salubrious climate of the area. Lodging could be found at Amasa Lincoln's Boarding House, now called the Upham Hotel (Santa Barbara's oldest hotel, it has been in continuous use since 1871) and the popular Arlington Hotel, which opened in 1875. 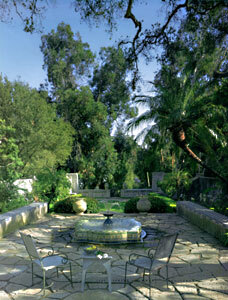 Still, there were few amenities in Santa Barbara to be enjoyed by visitors. A welcome whistle was heard in 1887 when the railroad extended service to Santa Barbara from Los Angeles, but the tracks stopped here for another 14 years while construction to the north was completed. The railroad connecting Santa Barbara with San Francisco was completed in 1901. The Potter Hotel opened in 1903, establishing Santa Barbara as a major American beach resort, attracting such glitterati as the Rockefellers, DuPonts, Peabodys, Fleishmanns, Carnegies and Swifts. All parked their private railroad cars at the new depot and enjoyed the "good life" - golf, polo and boating - available for $3 a day at the Potter. America's rich and famous bought property in adjacent Montecito and built baronial estates with exotic plants from around the world for their gardens. Today, visitors may tour several of these grand estates to glimpse Santa Barbara's "guilded age": Casa del Herrero, designed by local architect George Washington Smith with later additions by Lutah Maria Riggs and Joseph Plunkett; and opera diva Ganna Walska's Lotusland. Despite the fact that downtown Santa Barbara looked like many other small American towns early in the 20th century, greater change was in motion. Aviation pioneers, the Loughhead (Lockheed) brothers had their first factory in Santa Barbara, and John R. Northrup, who grew up in the city, worked for them there. Long before there was a Hollywood, the movie industry brought silent film celebrities to the area, when the major Flying A film company began shooting in Santa Barbara in 1912. Then, some residents who visited San Diego's Panama-California Exposition in 1915 decided that the Spanish Colonial architectural style, showcased there in Balboa Park, should be encouraged in Santa Barbara. The new city hall, the Santa Barbara Daily News building, the Biltmore Hotel, and the new Lobero Theater, which was designed by George Washington Smith, were some of the first projects exhibiting this new Spanish Colonial style. On the morning of June 29, 1925, a devastating earthquake struck, and damage to older buildings was severe. City planners began to enact regulations which would eventually produce the red-tile and white-stucco "Santa Barbara Look" we admire today. One of the most notable landmarks to be created after the earthquake was the new Santa Barbara County Courthouse, a masterpiece of architectural design created in 1929 by San Francisco architect William Mooser. 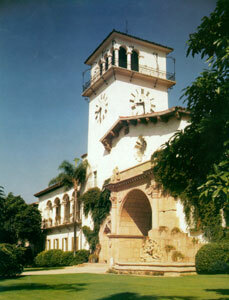 During the ensuing Depression years, Santa Barbara builders (many of whom were newly-arrived Italian stone masons) were kept busy building homes for the growing population, in addition to bridges, churches and WPA projects, such as the Los Banos public pool near the marina and a new post office to replace the one which is now the Santa Barbara Museum of Art. Since the 1925 earthquake, concern for preservation and reconstruction has become part of the Santa Barbara ethic. The only original part of the Presidio remaining, known as El Cuartel, was threatened by construction of the post office, but was saved by preservation minded citizens. The "Historic Adobe," which has been moved, now resides safely on the grounds of the Santa Barbara Historical Museum where it is leased by the Rancheros Visitadores. It is adjacent to the original Covarrubias Adobe, constructed in 1817 on the site. Other adobe buildings were also purchased and saved by those who saw Santa Barbara's elegant past beginning to be supplanted by gasoline stations and shops. Bernhard and Irene Hoffmann, who were early 1920s promoters of Spanish Colonial Revival architecture, bought the Lugo Adobe, which became the headquarters for the group led by Pearl Chase to influence design control and help save landmark buildings. The Hoffmanns also purchased Casa de la Guerra, which is now restored and open to the public. Their architect, James Osborne Craig, designed El Paseo on State Street, an outdoor shopping complex adjacent to the adobe in the Spanish Colonial style, which became the model for Southern California's outdoor shopping malls. Economic conditions in the 1970s nurtured the preservation of vintage Victorian structures and homes built in the late 1800s throughout Santa Barbara for middle-class families. Many of these structures were reborn 100 years later as charming bed-and-breakfast inns. However, the emphasis on preservation of Santa Barbara's past has not meant that progress and development have come to a halt. Paseo Nuevo, a downtown shopping center that opened on State Street in 1990, Fess Parker's DoubleTree Resort, completed on the waterfront, and the adjacent Chase Palm Park, finished in 1998, are examples of how the Spanish theme will be carried into the 21st century. Today, over seven million visitors from around the world enjoy the quiet charm of Santa Barbara every year and learn the true meaning of the inscription over a portal of the County Courthouse: "God gave us the country, and the skill of man hath built the town." And turned it into this paradise we call Santa Barbara. View the very best Santa Barbara real estate currently available at HarryKolb.com.